Sewing on the closed in porch. We headed deep into the eastern Kentucky mountains for the Memorial weekend holiday. I have talked often about our trips here in previous posts, but this trip was a new experience for our family. My mother-in-law re-married last fall after being single for 11 years (Mike's father passed away soon after we were married). After their wedding she moved over the mountain~ a 45 minute drive~ to Roscoe's home. This has been a tough transition for my boys who absolutely adore their visits to Nan's house. 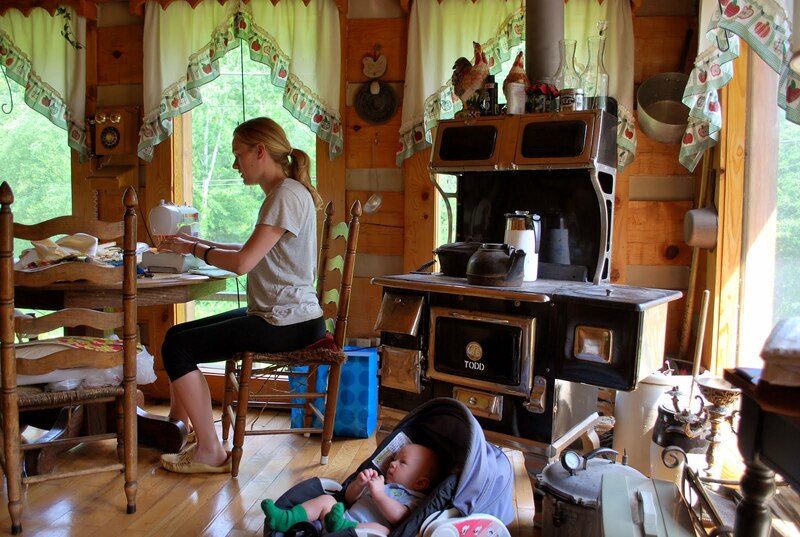 They treasure their times cooking in her large kitchen, exploring the mountain paths, making bonfires in the fire pit Mike and I built for her before Canaan was born. But life is full of transitions, isn't it? So we are learning to embrace this change and enjoying our times with Nan and Roscoe. Roscoe's log home is beautiful. We have the upstairs loft to ourselves and I kind of feel like a pioneer family tucked away together. So fun. 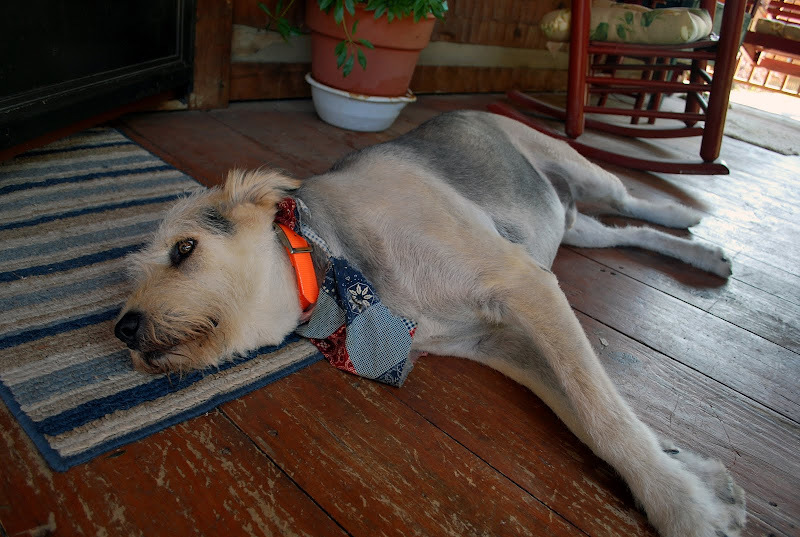 The boys are beginning to warm up to this new adventure at Roscoe's homestead. 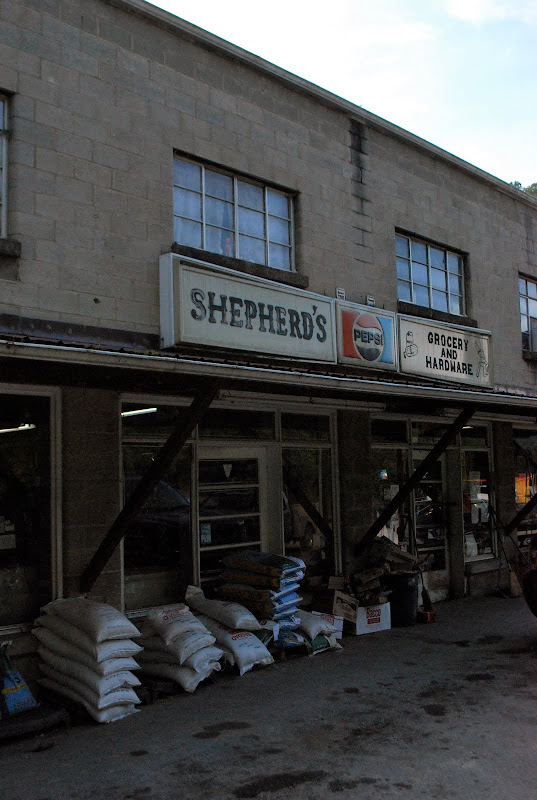 He owns the quaint country grocery store next door and within hours Ezra had figured out that Roscoe has a running tab at the grocery store. This led him to convince his Nan to take him over there for some treats...which she gladly agreed to. Canaan being our wise one (especially with money) reminded Nan that if she continues to do that, she will make Roscoe poor. We all had a good laugh over that one...well except for Canaan, who was dead serious. Our visits have taken on a new look and we are all learning to embrace the change and enjoy it. The boys still miss Nan's though and no doubt, always will. I'll post a bit more about our trip in the next few days. So many great memories to share. Are You Ready to Win Something? Canaan made us some ultra delicious chocolate chip cookies last night. Not really in my get-into-shape-post-baby diet but I ate them nonetheless. Kristi over at Giggles Down Under has a terrific little thing going called "A Happy Package", sending out little packages to blog readers from time to time. I love the idea, and asked if I could host my own little gig over here too. So here's how it goes; Sign up over on the right hand side for the newsletter. You will automatically have your name in the hat for a uber-fantastic little package in the mail from me. Once a month or so I will randomly select one of my blog readers to win. If your name is selected, I will contact you for your mailing address and within days you will have a little something in the mail from me! Our mantle is constantly changing. During the Christmas season it is strung with evergreen garland and dangling wool stockings. After Christmas I am ready to de-clutter the mantle a bit and so since January it has been fairly sparse. Just a few whiteware pottery pieces placed strategically in a line. Recently we were on an out of town trip and came across a shop with all sorts of letters. From over 3 feet tall to under 6 inches in height. Even better than finding such a great place was finding that everything, including the letters, were really reasonably priced. Mike and I spent a good half hour laying out all size letters on the shops floor to make our last name. All five letters came home with us for $30 and now have a home up on the mantle. On the other side of the room is our little music area. 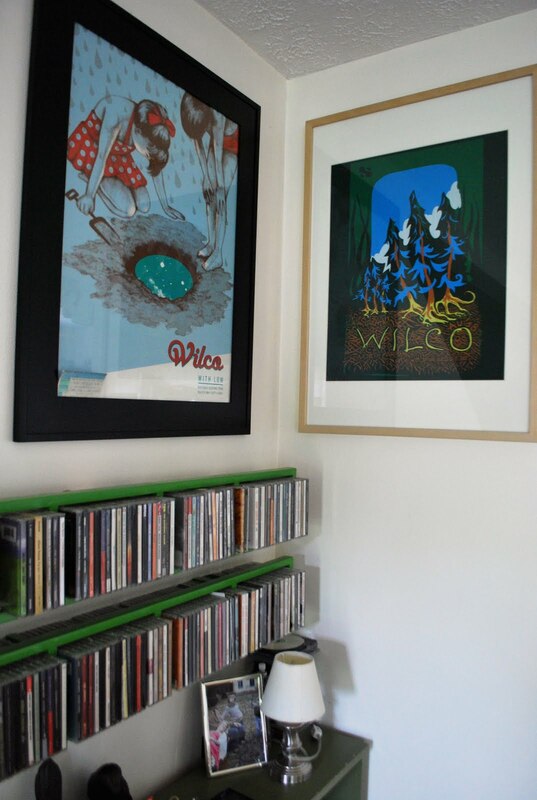 Mike, an avid Wilco fan, has been gifted these Wilco posters (by me) for the past couple of years. A local artist here in Lexington does many of the bands artwork so I was lucky enough to get the tree directly from his studio. Our CD collection (I know, old school in this I-Pod age) is pretty extensive so I rotate them in and out of our Ikea CD holder every once in a while. Speaking of music, what are you listening to nowadays? Canaan's favorite is always jazz. Everything from Dizzy to Ella. I have been loving Phoenix recently and throw-back country. I can't pass up a good George Jones or Merle Haggard song. Mike is loving Snow Patrol these days and of course, Wilco. I thought I'd do a bit of "around the house" photos this week. 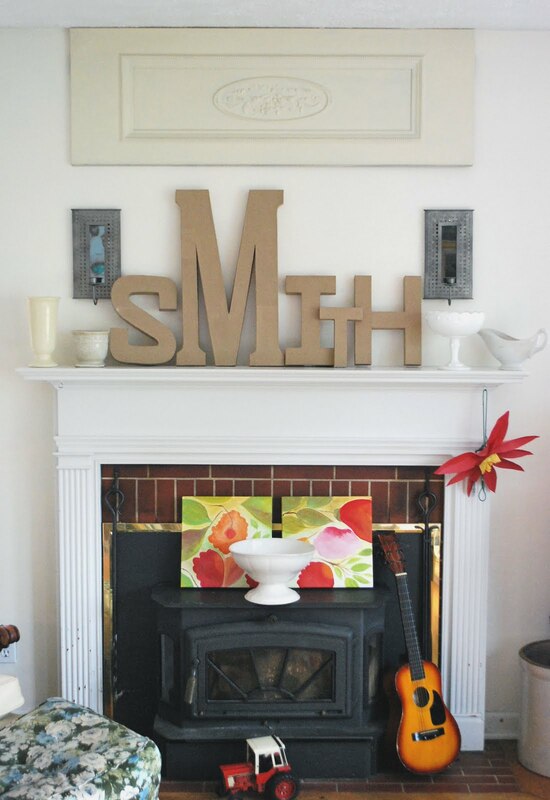 I always love seeing other peoples decor style and thought you may want to see what its like over here at the Smith Homestead. Our things change with the seasons. I move furniture around, change out pictures, knick knacks, and fabrics. This is our living room~ well one wall of it. 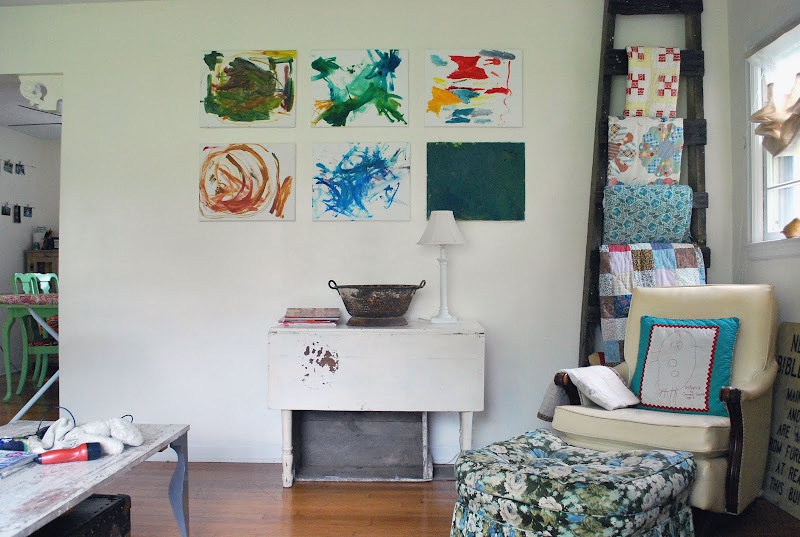 The paintings are ones that the boys did a couple of years ago and have found a permanent home on that wall. The table was an auction find over 10 years ago that I absolutely love. It has served many purposes. Kitchen table, sewing table, and side table. Underneath is a big old coal mine box that my mother-in-law bought me. I love the large rusted out colander on top of the table too. When we moved in we painted all of the walls a color called "poetic light". I am a bit afraid of color on walls (although I do love color) so I opt to add color through our accessories and that way I can always add or take away depending on my mood or the season. If anyone else would like to join me this week to show us around your house, please do! I would love to take a peak inside your home. I love that phrase. I read it recently and was struck by it. Yes, creativity is a habit. I don't believe some of us are born creative and others are not. I believe we each have in us creativity. Some develop it further than others, some find their niche and pursue it, and some neglect it~ but we all have it. I sometimes get frustrated when people see the work I do, whether sewing, painting, cooking, etc..., and say that it just comes naturally to me. I strongly disagree with that train of thought. Every creative endeavor I pursue takes hours,days, weeks, and years of practice. I have chosen to make creativity a habit in my life. I have chosen to tap into my creativity (that we all have) and pursue it further. I made loads of mistakes but I keep pursuing. I get burned out sometimes, but I keep pursuing. I do so because without developing my creativity and actively engaging in it, I surely wouldn't be nearly the wife, mother, friend, mentor, or child of God that I am meant to be. Recently, I have some super special gals that have a common mind in this whole area. We all have busy schedules yet make time to meet together over a cup of coffee and encourage, inspire, and challenge one another. We don't all have the same creative pursuits ~in fact they are quite different from one another, yet the common thread of purposely choosing to take risks creatively brings us together. So I thought I'd leave you this weekend with a couple of inspiring ladies. My sweet friend, Morgan, has just launched a new site called Morgan Day Cecil. It is incredibly inspiring and challenging. I am especially excited about her article on writing your manifesto~ I need to do that. Heather over at Shivaya Naturals also talked on it as well this week. I am also enamored and awe struck by the gorgeous photography by Sarah Beaty. 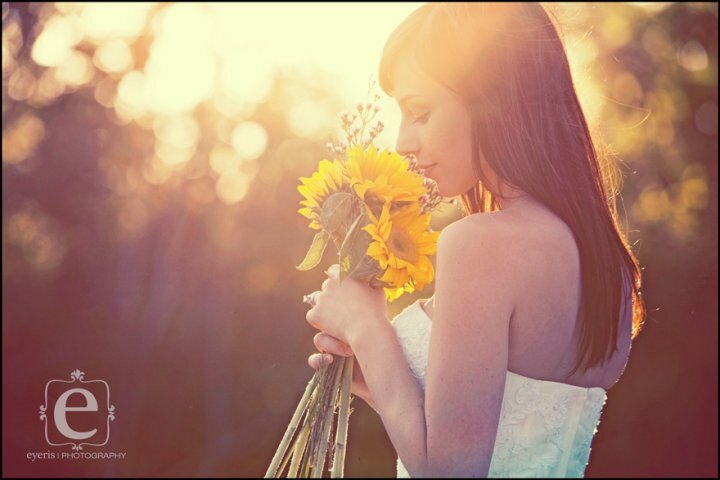 She is a wife, a mama, and a smart business gal who owns Eyeris Photography in Nashville. Just look at those photos. If you are within 100 miles of Nashville, you simply must book her. She's amazing. What are your thoughts in this area of creativity? P.S. Our adventures with Backseat Traveler have been many in recent weeks. You can see what we've been up to over here. Yes, we are just one more family that has joined the ever growing number of envelope system households. (click on the bold words to link to Dave Ramsey's website, if you are interested in reading further. )We have listened to Dave Ramsey over the years and we have taken many of his financial principles to heart. But this envelope thing just didn't seem like it would work for us. For one, we never use cash. Everything is automatically deposited, automatically withdrawn for bills, etc... So the idea of physically going to the bank to withdraw cash to then put into envelopes and carry around was just a bit more effort than we were wanting to put in. But after 11 years of marriage and 11 years of "discussions" about what our money was being used for we've decided to give this a try. And, I don't have the guilt of pulling out the debit card to buy something not knowing if it is really in the budget for the month. Since starting this, Mike and I have yet to have any of those annoying "discussions" over money issues. This whole things seems to just flow well for us. I hope we can keep it up. Like I said, the worst part is taking the time to go to the bank every paycheck and get the cash. But given the effecivness of it thus far, that is but a small sacrafice of time. Finding those little moments of peace and quiet in a house full of energy and life can be challenging. Curling up with a good book or having an extended yoga session has become a thing of the past. So for now, I try to find snippets of time in a day that give me a sense of calm and remind me to take a few moments for myself. Lately, I find that time with a daily cup of espresso. It started with a sale on Illy decaf espresso pods at Williams Sonoma. Typically, $14~ they were on sale for $3.50 (oh how I love a good sale!). So now, each afternoon while Ezra and Otto nap, I make my way to the kitchen, put my sweet little espresso cup (thank you Kris!) under the spout and listen to the soft hum of the espresso machine as it makes my little afternoon treat. I raise my little espresso cup in "cheers" to finding a few quiet moments throughout the week. I went out to get the eggs from the coop yesterday morning and can I just say, these first few minutes of the morning are quickly becoming a favorite part of my day. My short walk out to the chickens gives me a few minutes to breathe in the morning air and give thanks to God for such a wonderful life. I find myself talking out loud at times showing graditude for so many things. Thankfulness for this amazing home we've created. We looked for over 5 years for a house. We wanted to be in the hustle and bustle of the city but also had a deep craving for a simple country life. This home has given us both. We are just two miles from the heart of downtown yet our backyard is filled with endless acres of tranquility and nature. And chickens! I never would have imagined having chickens...I feel like a true country gal. I am thankful for our health each and every morning. Thankful for a house full of boys that continually remind me to let loose and not take life too seriously. I am thankful for a sweet, nearly 3 month old, baby who is sleeping through the night. I am thankful for my friendships~new and old. And more than anything, I am thankful for living this ridiculously amazing life with Mike. That man is beyond my perfect partner. After months of planning, sewing, pricing, and a bit of stressing, Mayfest has come and gone. A cold snap moved through late Friday night which led to a rather chilly (my favorite kind of weather) start to the weekend. We had no idea what to expect from our first festival. Thankfully, despite smaller crowds because of the weather, we still had a great time. We ate loads of Kettle Korn. I am not kidding when I tell you that I ate it for breakfast and lunch both days. We were also spoiled to be near the stage so we were continually entertained by performances like this one from the Vintage Dance Society of Lexington. We met so many friendly people in those two days. 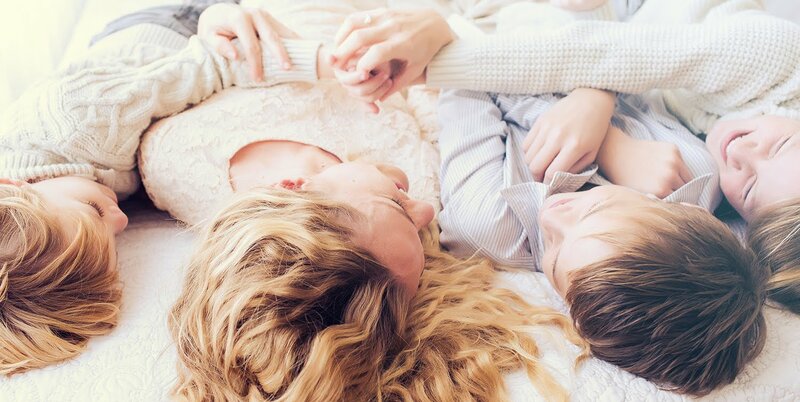 Lots of families with kids our age (fun playdates ahead! ), readers of my blog (which is always humbling and odd that people know about me and I know nothing about them), and lots people who recognized my little company from years of selling at local shops. I was also surprised at how friendly the other artists were at the market. They all seemed to take us under their wing and "show us the ropes". Mike is the best employee ever. I am not sure if, or when, we'll do another festival. It definitely posed some challenges with a newborn and finding help with our other 2. I may set up for a few weekends this summer at the Artists Market downtown that happens during the Farmer's Market...but well see. For now I am glad that its over. Standing on concrete for 2 days straight is quite tiring on the legs. I remember dreading "leftover night" at our house growing up. The thought of re-heated spaghetti or warmed up salmon patties was about as unappetizing as any thing imaginable. Fast forward to my own parenthood and facing "leftover night" with my own boys. Every couple of weeks or so I open the fridge to find it stuffed full of leftovers. A half pan of lasagna from Monday night, a bowl of rice from Wednesday. How can we make this a bit more exciting? Introducing the "Fancy Smith Restaurant". The afternoon of the dreaded leftover night I pull everything out and start making a list. From that list I compile a menu~ thus our Fancy Smith Restaurant Menu. I quickly type out a menu with "fancy" font in a word document using a little creative wording to make things sound more appealing and have it printed out and waiting for the boys at dinner time. And guess what...it works! Oh how they love leftover night now. They love having a menu to choose from as much as I love using up the leftover food without the moans and groans of the little ones. So when life gives you leftovers...make a fancy menu. This undoubtedly can be translated into life in so many other ways. It brings to mind the phrase "when life gives you lemons", right? I am a firm believer in this principle and try hard to raise our boys with the same mindset. I could get on a big soapbox about this topic, and have before (read here), but I'll spare you this time. Lots of cooking and baking happening over here~ this is fairly typical though. We all love to cook so it seems something is always happening in the kitchen. Whether it is a batch of Saturday morning waffles being made by my hubby or marinating fish headed to the grill for fish tacos, there is an endless amount of food being produced in this house. And since we're on the topic of food, we are in the midst of watching the eye-opening documentary, Food Inc. We get about 20 minutes of the 2 hour film in every couple of days or so in between homework, dinner, nursing, and bath time. This film is rocking our world. That, combined with some other research we've been doing, we have definitely turned a major corner on this whole organic bandwagon. We have been buying organic milk and eggs for the past 3 years or so but biting the bullet and paying more for meat just hasn't happened...until now. Not only are we committing to buying organic meats, we really want to take the further step to buy local, organic meat near our home. Although we live on a fairly tight grocery budget we are going to start transferring allotted money from other areas in our budget to cover the additional cost. Its just that important.